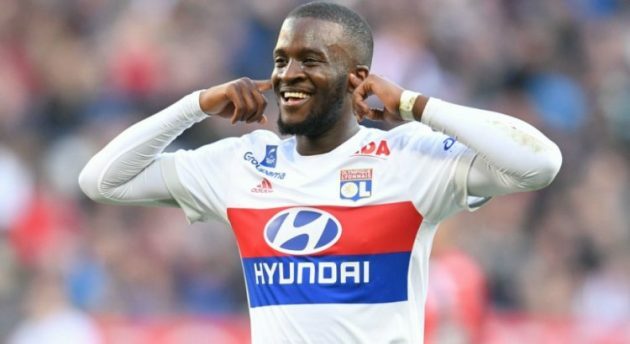 Lyon midfielder Tanguy Ndombele is drawing interest from a host of Europe’s biggest teams, including Premier League trio Manchester City, Manchester United and Tottenham Hotspur, according to a report. The 22-year-old star has impressed in the UEFA Champions League for the French club, including in a win against the Citizens in the group stage. Tanguy also made his debut for his country this campaign, picking up four caps for France to date. Serie A champions Juventus are also interested in the dynamic midfielder and will battle the three EPL sides for his services this summer reports an Italian outlet CalcioMercato. A big transfer seems increasingly likely for Tanguy, but the Frenchman will not go cheaply, with Lyon owner Jean-Michel Aulas wanting around €75 million (£63.8 million) for the young star. With four European heavyweights, all of which are in the UEFA Champions League quarter-finals this season, battling for the star’s signature, the price tag is improbably to drop too much. The France international Ndombele has been something of a workhorse for Les Gones since arriving from the French club Amiens at the start of the last term for an undisclosed fee reported to be a bargain €8 million. He made 50 matches in all competitions the previous season and has already made 37 this season. Ndombele netted two goals last season and the star managed the same amount this time around as well. The former Amiens player is now rated at €50 million via Transfermarkt but, as aforementioned, the club’s chairman is demanding more than that amount of money.